On July 10, Homeland Security Secretary Michael Chertoff told The Chicago Tribune he had a “gut feeling” the U.S. was at heightened risk of a terror attack. The remarks quickly reverberated throughout the news media. Nerves were already a little jangled. Only 10 days earlier, on June 29, police in London discovered two un-detonated car bombs in heavily trafficked areas. And one day after that foiled plot, attackers smashed a vehicle into Scotland’s Glasgow Airport. In the days after Chertoff’s gut feeling and the UK episodes, the press also reported on additional terror-related news. First came the release of a new National Intelligence Estimate warning of a reconstituted Al-Qaeda threat. Then the Transportation Security Administration sounded a warning after the confiscation of several strange airport packages—such as a block of cheese and a cell phone charger—raised fears that terrorists might be practicing “dry runs” for another attack. Without the other events, a government report and a TSA warning might not have attracted the same attention.Indeed, while there were no terrorist attacks against the United States in the third quarter of 2007, U.S. domestic terrorism became a much bigger part of the news menu than before. The subject filled 3% of the newshole in PEJ’s news index and registered as the fourth-biggest overall story. 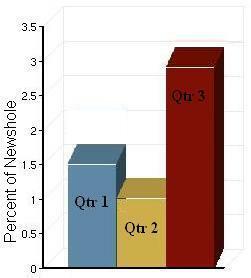 That represented about a three-fold increase over the second quarter, when the subject accounted for only 1% of the newshole. And that number for the domestic terrorism category does not include the attempted terror attacks on UK soil. Were the UK attacks and other terror-related stories such as a Bin Laden video included, terrorism would have accounted for 6% of the total newshole studied, and would have ranked as the No. 3 topic in the news, close behind the Iraq policy debate and the race for president. Coverage of domestic terrorism in the third quarter was also remarkably balanced among different media. It generated roughly the same attention in all five sectors studied, ranging from a low of 2% in online and network TV to a high of 4% on cable. The bomb plot in Britain in June deserves some mention on its own. The London saga took an unusual turn when it was learned that a number of suspects were doctors, or, as ABC’s “Good Morning America” put it, “professional healers who were apparently determined to kill.” That strange twist was enough to make the so-called “doctors’ plot” the biggest story, at 14%, for the week of July 1-6. That represented the highest weekly level of coverage of any terrorism-related issue in 2007. Years have passed since the aftermath of the 9/11 attacks when the anthrax scares and changes in the color-coded threat status seemed like a daily staple of the news menu. 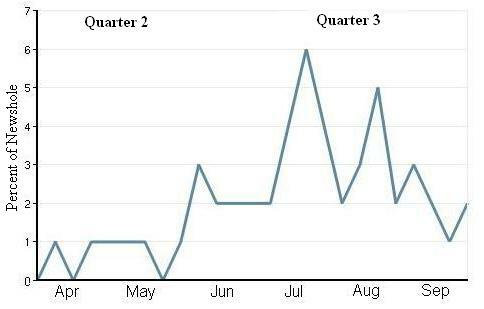 Coverage of terror-related issues now seems to follow an uneven trajectory, with long periods when the subject becomes virtually invisible.The major outbreak of coverage that began in July, was, in fact, preceded by a sustained period of minimal media attention. Terrorism, or the threat of it, was not a top-10 story in nine of the 12 weeks leading up to the discovery of the UK car bomb plot. And only once in that three-month period—with the foiling of a plan to attack New Jersey’s Fort Dix in early May—was the topic one of the top five stories in the news in any week as measured by PEJ. But this summer’s London plot followed by Chertoff’s intestinal instinct showed how close to the surface the subject is in the American psyche, or at least in the media’s gauging of it. The sense that leaders are worried, or some formal sign that something might happen, are enough to trigger significant terror jitters in the press and turn the topic into a major part of the news agenda.